Kuwait, April 14, 2019: Swim, Soak and get tanned! Head down to the Symphony Style Hotel Kuwait’s pool deck to do get all this and more. Weather it is a stress-busting swim, a lazy afternoon or the view of one sunset you are craving for, being seen next to the perfect azure mosaic pool of Symphony Style Kuwait, A Radisson Collection Hotel, is granting you a new cool & desirable status among your peers this summer. Lay under the sun where you are surrounded by style, touches of luxury and comfort all around you. The bespoke pool chairs and loungers create a serene setting and enhance your experience under the summer sun. You can also tuck into the simple, yet sumptuous food from the new pool menu. Whether it’s a Classic Caesar Salad or a Seasonal Fruit Platter, a Chicken & Rocca sandwich or a Classic Angus Beef Burger, there’s plenty of choice to refuel as you stay cool. Kids are catered for, while an extensive drinks menu includes concoctions such as a banana colada or Punchbowl, teas, coffees and soft drinks. 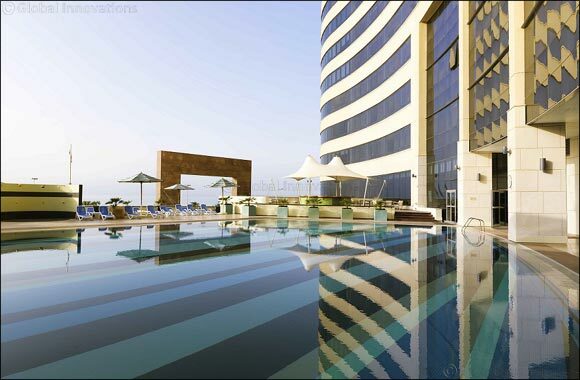 The swimming pool of Symphony Style Kuwait, A Radisson Collection Hotel, is the place where you can truly set your own pace.